Globalization, demographic shifts, increase in student enrollments, rapid technological transformation, and market-driven environments are altering the way higher education operates today. Institutional Research and Planning in Higher Education explores the impact of these changes on decision support and the nature of institutional research in higher education. 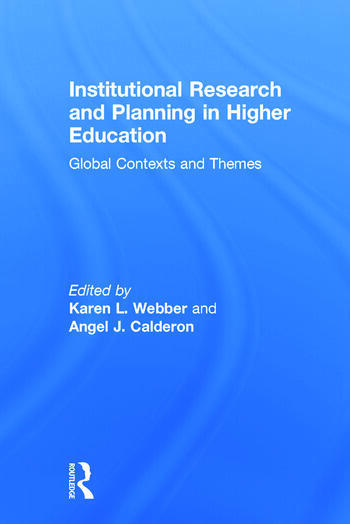 Bringing together a diverse set of global contributors, this volume covers contemporary thinking on the practices of academic planning and its impact on key issues such as access, institutional accountability, quality assurance, educational policy priorities, and the development of higher education data systems. Karen L. Webber is Associate Professor in the Institute of Higher Education at The University of Georgia, USA. Angel J. Calderon is the Principal Advisor of Planning and Research at RMIT University, Australia.